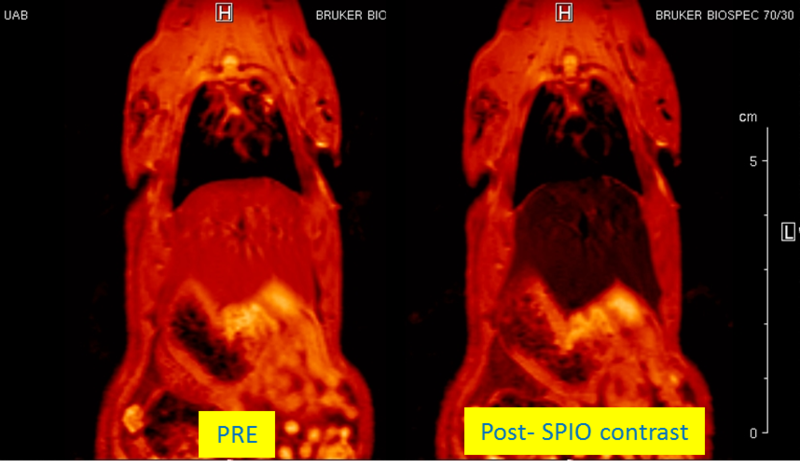 Magnetic resonance spectroscopic imaging (MRSI) of hyperpolarized [1-13C]pyruvate is a promising technique to noninvasively monitor metabolic changes in vivo. 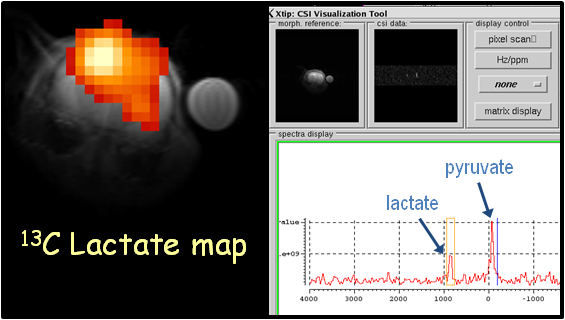 This method uses dynamic nuclear polarization (DNP) techniques to obtain tens of thousands fold enhancement in the polarization of [1-13C]pyruvate and its metabolic products, like lactate, providing sufficient MR signal for high spatial and temporal resolution spectroscopic imaging of these metabolites. This technology is especially promising in oncology, where lactate levels have been shown to correlate with disease progression and response to therapy. Hence, the injection of 13C-pyruvate and assessment of 13C-lactate can be used to distinguish, and best characterize, cancerous tissue. 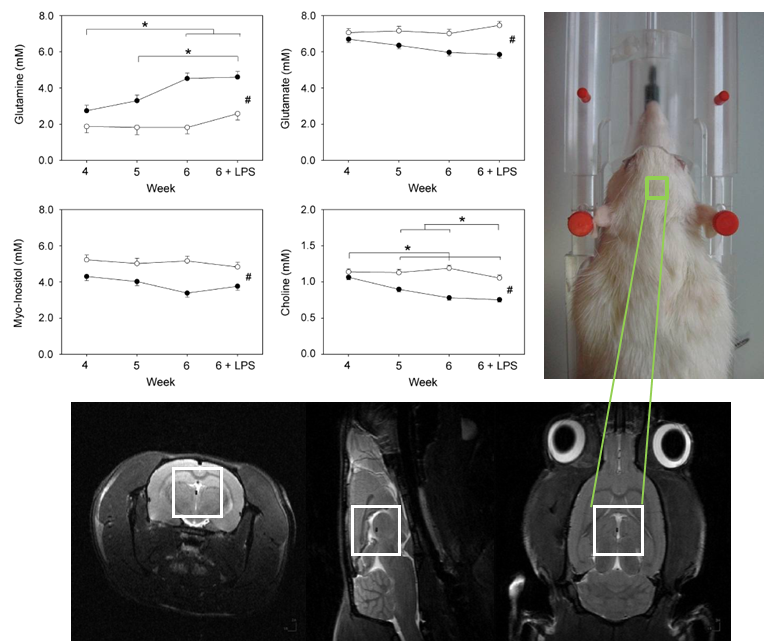 In recent experiments performed at our NMR facility, we were able to optimize experimental conditions to detect pyruvate and lactate 13C labeling, using 13C chemical shift imaging, following intravenous injection of hyperpolarized [1-13C]pyruvate into a mouse with implanted GL261 mouse glioma cells. 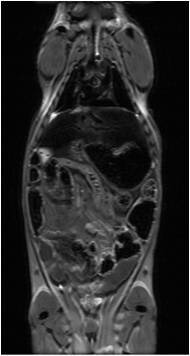 Metabolic images showed significant labeling of pyruvate and lactate within the tumor region but comparatively low levels in surrounding brain. 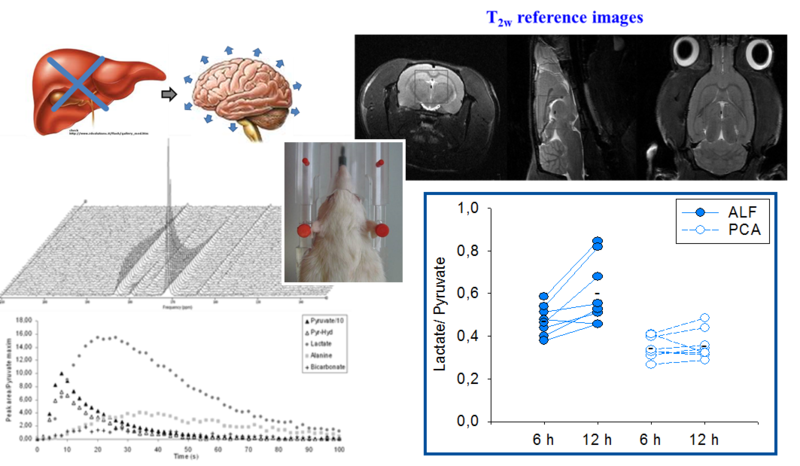 For these experiments, [1-13C]pyruvate was hyperpolarized using a HyperSense DNP polarizer (Oxford Instruments) and 13C MRSI was acquired in a 7T small animal MRI scanner (Bruker Biospec). Pyruvate is only one of several substrates that can be studied using these hyperpolarization techniques; other metabolites including acetate, succinate, fumarate, choline, and fructose have also been described in the literature.